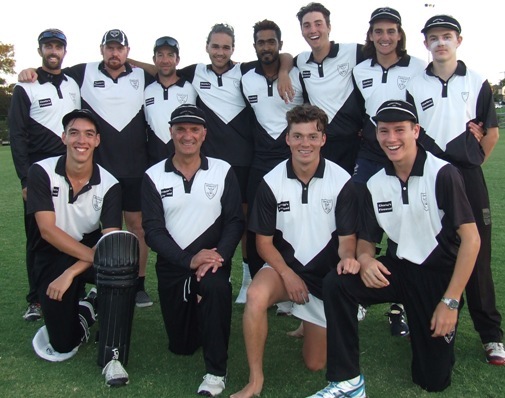 Moonee Valley fell short in the Twenty20 Grand Final on February 6, but there was a lot to like about our tournament and the big match. In a window to an exciting future as a Club, six of our players in the Grand Final were teenagers, and we were captained by Daniel Comande at the ripe old age of 22. The seven bright young stars played the majority of our four games in the knock-out tournament, run by the North West Metropolitan Cricket Association. At right: Our T20 Grand Final team. L-R: Back - Michael Ozbun, Nate Wolland, Ben Thomas, Luke Brock, Chanaka Silva, Stephen Esmore, Anthony Cafari and Charles Bibby. Front - Nigel Cowan, Lou Raffaele, Daniel Comande and Jack Newman. 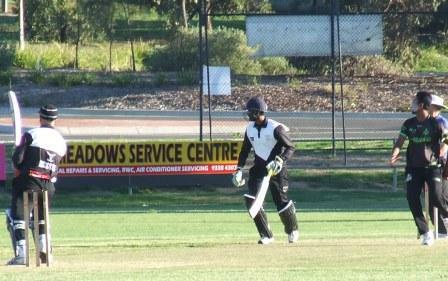 We came up against a seasoned team in the Grand Final in Westmeadows, which plays VTCA in a division two grades higher than Moonee Valley, and was stacked with international and contract players. Moonee Valley 70 lost to Westmeadows 7/163. Westmeadows won the toss and batted first at their home ground, with the game played on turf as both our clubs are turf at the top grades. We both endorsed the switch to turf, even though the NWMCA is a hard-wicket competition. Westmeadows got off to a flier, at 0/100 after the first 10 overs, so it was a top effort to peg them back and take regular wickets when we had been staring at a 200-plus chase. We never got any momentum going in the run chase, without support for opener Lou Raffaele’s hard-hitting 34. Moonee Valley has supported the NWMCA Twenty20 competition every season since its inception more than a decade ago. In that time we have won two Premierships – 2008/09 and 2009/10 – and made the Grand Final in three other seasons. 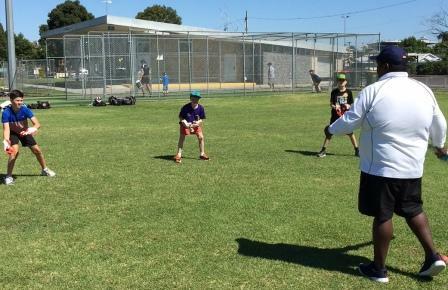 At right: Lou Raffaele dispatches a ball to the boundary, watched by batting partner Chanaka Silva. Our teens were Charles Bibby, Luke Brock, Anthony Cafari and Nigel Cowan, all 19; Jack Newman, who turned 19 the day before the Grand Final; and Stephen Esmore at 18. Guys, we’re proud of you. Moonee Valley senior players held a clinic for our juniors on February 3, and it's obvious that we've got some stars of the future coming through the ranks. 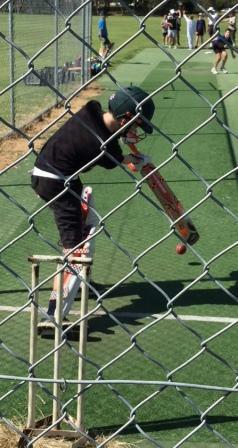 At right: We've got some talented batsmen coming through the junior grades. About 10 senior players - most of them regulars in our First and Second elevens - took sessions with the juniors and helped them skill up in specific disciplines. It was the second junior clinic we held for the 2017/18 season, following on from a successful session we conducted the year before to give our juniors a taste of what they need to do and develop to be successful at higher senior grades. Above: First Eleven wicketkeeper and Director of Junior Cricket Channa DeSilva takes some of our junior keepers through their paces. Facing the bowling machine and some of our senior bowlers gave the up-and-comers the chance to put their skills and training to good effect, and demonstrate how they're developing. Club President Charlie Walker said a healthy future for any club depended on the development and enthusiasm of its junior grades, and Moonee Valley had a lot to be excited about. Moonee Valley had multiple reasons to celebrate at the Barooga Over 35s tournament in January - and the Valley Boys (and girls) turned out in force to ensure that the Wednesday night was one to remember. The January 15-18 tournament was the fifth year in a row that Moonee Valley has been represented, and also gave us the chance to hold reunions for the MVCC 2009/10 First Eleven and 2015/15 Sixth Eleven flags. 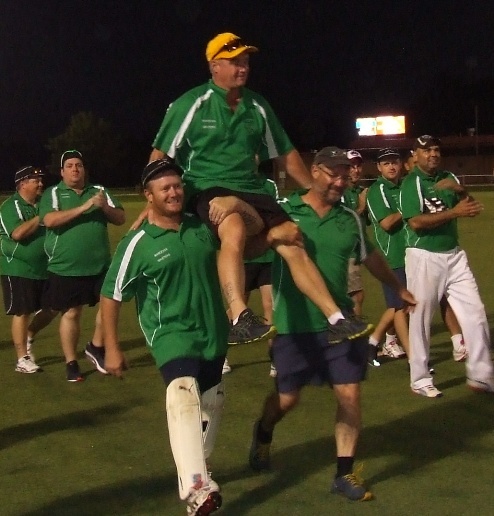 Not to be outdone, the Barooga Cricket Club kicked in with their own reunion, of their 1996/97 Premiership. There was the one constant in all the multiple celebrations - Moonee Valley's Barooga-born Sean O'Kane. He played in both our flags and the Barooga premiership, initiated our annual Barooga Masters entry and with Mark Gauci, Daniel Phillips and Neil King is the only played to have competed in all of them. And to top it off, the Moonee Valley Cricket Club bestowed Life Membership on Sean in a surprise presentation which caught him completely off guard. Sixths teammate Brett Curran and Club president Charlie Walker spoke, and Sean had no inkling what was about to be announced until the last few words. Close mate and Premiership teammate Dean Jukic pinned the Life Membership medallion on his chest - and the large crowd - more than 40 Moonee Valley players and supporters and a big Barooga crowd - erupted. At left: Chaired off after the win, and with a wicket in his last over. Sean O'Kane with his brothers Peter (left) and Mark. Sean used his Life Member powers to make an edict, and as a result a merry band of teammates stayed the night at the Barooga Cricket Club and greeted the dawn on the Thursday morning. Oh, and by the way - we won the Wednesday match in a canter, Sean took a wicket and showed his trademark power hitting and incredible fielding, and was chaired off the ground by his brothers Mark and Peter. While all three O'Kanes have played cricket at Moonee Valley, the Wednesday match was the first time they had ever played together. SOK opened the batting with POK, who was then joined by MOK at the fall of the first wicket. Peter said they'd played together "in the bathroom" at home as kids, but never on the field together until under the Valley banner at their home town Barooga. The reunions attracted players from far and wide. Eight of the players from the First Eleven flag took to the field for the Wednesday game under lights at the magnificent Barooga No. 1 oval - Rajan Aiyappan, Amit Chaudhary, Mark Gauci, Sean O'Kane, Kane Harding, Matt Thomas, Pat Felmingham, Craig Pridham - Matt and Pat as 12th men as they don't qualify for the Over-35s age criteria. The Sixths Premiers were also well represented at the reunion - Brett Curran, Paul Hobbs, Sean O'Kane, Kevin Gardiner, Paul Edwards, Peter O'Kane, Mark Gauci and Dean Jukic. And regulars from that season in Norm Wright, Mark Madden and Tony Sherer - over from America with Clarissa - made the trek to Barooga for the occasion. UK player Kris Garland, who played two seasons with Moonee Valley - one sharing an Ascot Vale house as a guest of Sean - came out from England to be part of the celebrations, and pulled on the Valley whites for three games on his flying visit. Thanks to Daniel Phillips and Michael Ozbun for organising the special emerald green Valley shirts, which all had the name SOK printed on the back. They were quite outstanding on players and supporters alike, and will be a lasting memento of our Barooga fifth anniverary. The Moonee Valley Cricket Club thanks Mick O'Dwyer for again hosting the Barooga Over 35s tournament and putting on the hospitality of the Barooga Cricket Club - which included turning a blind eye to Sean and the crew taking over the rooms and the bar until dawn. Last updated: February 6, 2018.